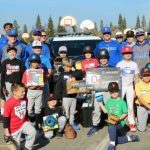 Folsom Baseball program ran a Toy Drive Baseball clinic this past Saturday, December 3 for ages 8-12. Many people donated and the Folsom Police Department picked up all the donated toys. Way to Go Folsom Baseball and thank you to everyone who donated toys!